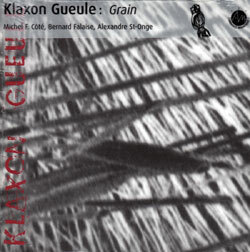 Translating to "this is not", the experimental Montreal trio of Michel F. Cote, Alexandre St-Onge and Bernard Falaise have for 20 years experimented in sound, bridging rock, experimental and improvised forms, here in a 3-CD retrospective of studio works from the last 16 years with collaborators Jean Derome, Ellwood Epps, Sam Shalabi, Philippe Lauzier, and Christof Migone. 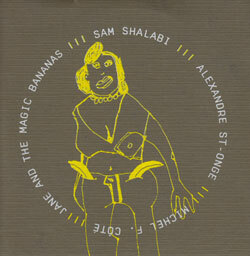 The 35 poems found on Fortner Anderson's "Solitary Pleasures", performed with Michel F Cote, Sam Shalabi and Alexandre St-Onge, speak of the obsessions, phantasies and encounters of Anderson's life. 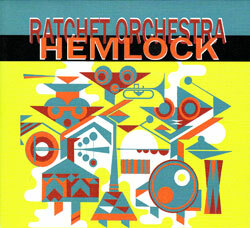 The Ratchet Orchestra is a large ensemble of 30 fringe musicians from Montreal headed by director Nicolas Caloia whose compositions allow for improvised chamber jazz and showcase the talents of the orchestra's most passionate players. Montreal free improvisers in an album straddling improvisation, actuelle, and rock influences, with drummer Michel F. Cote, guitarist Sam Shalabi, and bass/electronicist Alexandre St-Onge. 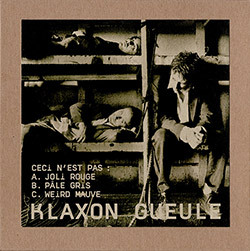 Michel F Cote, Bernard Falaise, Alexandre St-Onge, Christof Migone, and Sam Shalabi, all members of the excellent group Klaxon Gueule, in a minimalist release of improv.